All performing arts fans take note as The Actors Studio proudly presenting Brian Friel’s Faith Healer at the Kuala Lumpur Performing Arts Centre from Thursday, 6th November 2014 till Sunday, 9th November 2014. 10% discount until 16th September, 2014. 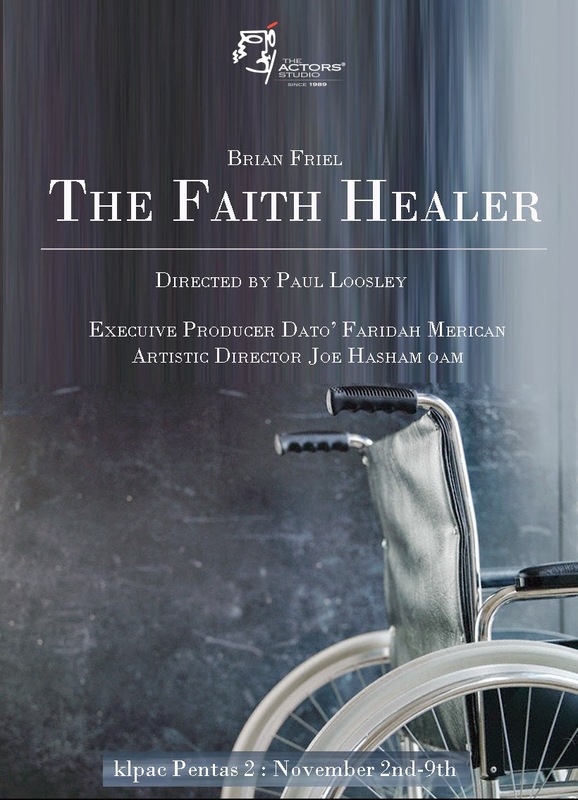 Faith Healer is written in 1979 and is one of Brian Friel’s most performed and most respected works. It is almost always in the repertoire on Broadway, in the West End and throughout the world. Brian Friel is considered to be one of the greatest living English-language playwrights and has written more than thirty plays in a sixty year career. His works such as Philadelphia, Here I Come and Dancing at Lughnasa are considered as important as any of the works by the great playwrights Anton Chekov, Henrik Ibsen and Samuel Beckett. The play consists of four parts with a monologue making up each part and they are chronologically given by the faith healer, Frank Hardy, his wife Gracie, Frank’s cockney manager Teddy and finally Frank again. The Actors Studio has had a long held connection to Brian Friel; especially having presented his most recognized play; Philadelphia, Here I Come, several times. Artistic director of The Actors Studio, Joe Hasham OAM, who also directed these performances of Philadelphia, Here I Come is a huge lover of Friel’s work. “The opportunity to see another of Friel’s plays produced by our company gives me untold pleasure; I will be hanging on every gesture, every word;” he says. Faith Healer opens at The Kuala Lumpur Performing Arts Centre from Thursday 6th November 2014 to Sunday 9th November 2014. To purchase tickets, please log on to www.theactorsstudio.com.my and www.klpac.org or call klpac box office at 03-40479000.